International medical graduates (IMGs) are physicians who have graduated from a medical school outside of the country they intend to ply their trade. Medical schools around the world vary in education standards, curricula, and evaluation methods. This is the reason why many countries have an international medical graduate program, corresponding to the educational commission for foreign medical students (ECFMG) in the United States. The purpose of ECFMG Certification is to assess the readiness of an IMG international medical graduate to enter clinical specialty training programs as resident physicians and fellowship programs in the United States. It further helps to promote career options for an IMG residency graduate in the USA. Physician and physician specialist: A physician is a doctor who has completed further completed further training in a medical specialty to diagnose and manage complex medical problems. He/she is a person who is legally qualified to practice medicine. IMGs taking on this program are expected to perform professional medical work conducting mental, physical and neurological examinations on patients. They are also expected to diagnose illness, testify as an expert witness to the mental and physical state of the patient. Physician programs are usually performed in-country health departments, schools or correctional infirmaries, and state hospitals (long-term care, psychiatric, acute care, clinics, and veterans). Public health scientist: Public health scientists are specialists in the science and art of preventing disease, prolonging life and promoting human health through organized efforts and informed choices of society, organizations, public and private, communities and individuals. They are mainly concerned with threats to health based on population health based analysis. IMGs, searching for IMG residency, who decide to embark on this program are expected to analyze and report on a variety of public health data, including mortality and their place of residency’s data. Skincare is also an important part of public health and exposure to an international medical graduate dermatologist is given! Clinical reviewer: Clinical reviewers perform medical record reviews to determine the quality of care; identifies quality issues and assures compliance with medical record standards and regulatory mandates. This program requires IMGs to mainly stay well-informed about changes in clinical guidelines and changes in their residency’s performance management measures and systems. Assistant medical examiner: The assistant medical examiner performs a specialized job in the determination and causes and manner of death. The assistant physician international medical graduate program requires IMGs to perform autopsies and postmortem examinations to determine cause and manner of death. They also amass evidence for law enforcement agencies and prepare reports of postmortem examination and autopsies. The assistant M.E also reviews medical records, police reports and the reports of toxicologists as required to correctly determine cause and manner of death. They can also make decisions concerning the release of organs and tissues for transplantation purposes. This program can also apply to international medical graduate psychiatry as well. Research specialist: A research specialist is an individual who has proficiency and a strong propensity in the area of exploring a particular subject. He or she collects information from reputable sources, such as governmental organizations, academic institutions, and online journals. IMGs in this program are expected to obtain a medical history, search for details such as patients’ allergies and the possible side effects of drugs. They also help in responding to data queries and other types of queries. HMS Exchange Clerkship Program: The Harvard Medical School (HMS) exchange clinical clerkship for IMG program is an IMG program and is one of the largest visiting student programs in the U.S, it was put in place to ensure students assigned to Harvard-affiliated hospitals are fully ready to partake in Harvard’s advanced elective experiences, HMS screens all applications and reserves the right to restrict those who may be assigned. To be considered eligible to participate in the Exchange Clerkship Program, students must be in their final year of medical school. The educational systems of many non-US or Canadian medical schools range in duration from 4 to 6 years; thus, in a 6-year medical school system (e.g., German medical schools), students must be in their 6th year to be considered the equivalent of a US 4th year medical student. To be eligible for participation in the Exchange Clerk Program, students must be enrolled in a medical school that is part of a university. Students in “offshore” medical schools, for-profit medical schools, proprietary medical schools, or stand-alone outside of a university are not eligible for this program. Completed application for the Visiting International Student Elective Program submitted 4 – 6 months before the start of the chosen elective. Copy of IMG student’s current transcript. Curriculum vitae (CV) that list student’s education, publications, and other professional accomplishments. Letter of recommendation from a member of the faculty at student’s medical school who has observed student’s clinical skills. Proof of health insurance obtained from student’s health insurance company. Personal statement describing student’s career goals, how this experience will help the student achieve them, and what student has accomplished thus far in pursuit of those goals. A record of student TOEFL scores is required if the student is a non-native English speaker. Note: The above-required documents must all be written in English or accompanied by English translations. UCLA International Medical Graduate Program: The UCLA IMG Program was put in place for IMG students from Latin America or a Spanish-speaking country who are interested in obtaining residency training in family medicine and a medical license to practice in California. The goal of the UCLA IMG program is to provide bilingual (English-Spanish) family physicians for the state’s underserved rural and urban communities which include large Hispanic and other vulnerable populations. 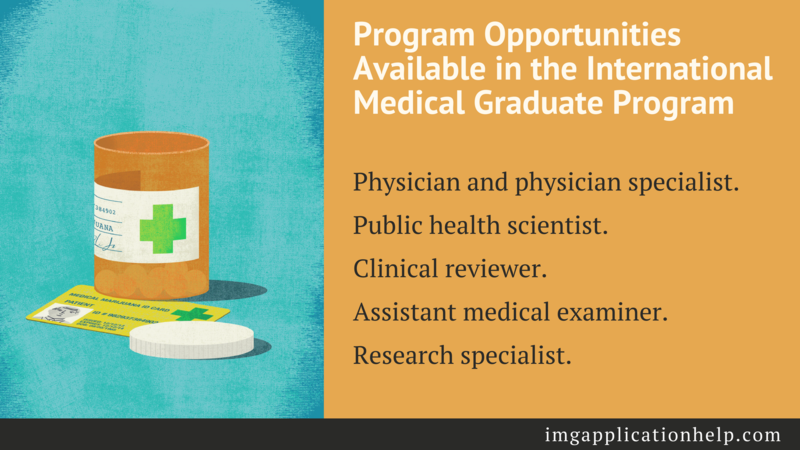 Only international medical graduates (IMGs) or medical students from medical schools recognized by the Medical Board of California are eligible for residency to apply to this program. If your school is not recognized, you will not receive the postgraduate training authorization letter (PTAL). Hence, the above-mentioned will help you make the right choice for IMG alternative careers and to also see which international medical graduate program that you will fit into well! We will also provide assistance with your medical research fellowship for an international medical graduate to help increase your admission chances. You can also have a look at a CV sample compiled by our team to help with your writing. So get in touch with us today and experience the best international medical graduate program assistance online!